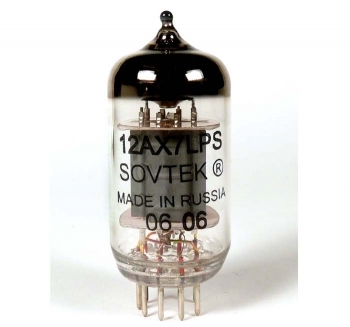 Vacuum tube for audio and guitar by Sovtek, Russia. The excellent new design "long plate" version, patterned after the Mullard long plate design, very low noise and microphonics matched pairs provided on 2+ pcs. Excellent harmonic overtones, doesn't have the sterility of the other Sovtek designs. Sounds as good as many NOS tubes! Needs about 30 hrs. of break in time. LOW NOISE AND MICRO PHONICS TESTED CRYO TREATED GRADE. THIS TUBE IS AMAZINGLY TRANSPARENT AND NEUTRAL WHEN CRYO TREATED!